Here's an observation from a recent grocery trip. Now, you know that I am a fan of quality whole foods yet also trying to stretch our dollars. I looked at 3 loaves of bread. All were decent, to be sure. One is a nice bread from a bakery in Colorado. Seems like good quality. 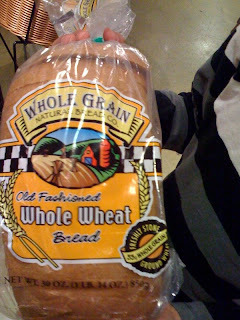 The next bread is the store brand (Whole Foods). 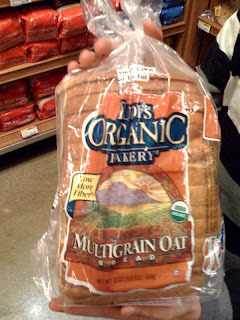 I read the label and realized the ingredient list is the same as the first loaf! 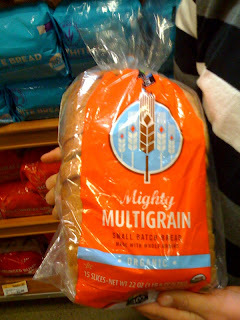 While both loaves have no hydrogenated oils or high fructose corn syrup, they do have 20 ingredients. And finally, the loaf of bread that I think tastes great. It is made locally and the ingredient list is about as simple as a homemade loaf: 100% freshly stone ground whole wheat berries, water, honey, yeast, sea salt and nothing else. My question is this: which would YOU buy? We had this problem too - trying to balance cost with quality. Our solution was to buy a bread machine (6.99 at our local goodwill) and make our own. It took a little bit to figure out the recipe that worked for us but now making bread takes less time then a quick run to the grocery store. I would buy the last one. But if you like Rudi's they have coupons a lot. Of course my food budget varies so sometimes I buy fresh bakery bread and other times from the grocery store. Are they all organic?? lol If not the organic one would be my pick. Of course I like making my own the best. Right now due to lack of baking space I do half homemade and half store bought each month. Since I live alone and don't eat a lot of bread, I would probably buy the local one with the fewest ingredients. When I was feeding my large family, I would have been delighted to find the Whole Foods brand. When the children were little I baked all our bread because I couldn't find any decent bread.